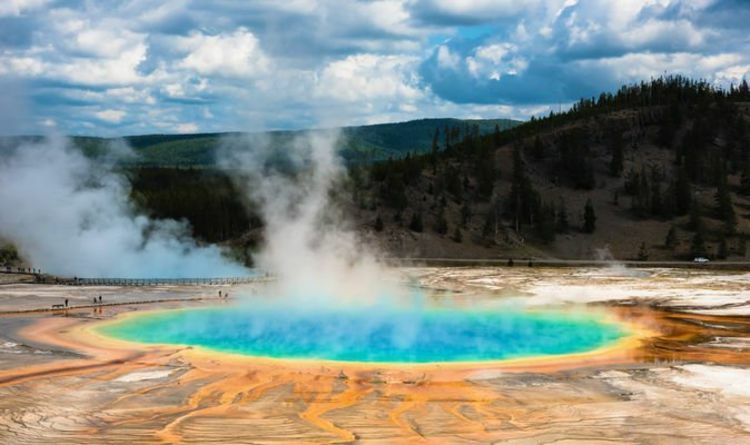 Yellowstone volcano monitoring stations recorded an incredible 127 tremors throughout the national park – 46 more earthquakes than in February. Yellowstone seismicity in March included two terrifying earthquake swarms which struck on March 25 and March 28 respectively. The first earthquake swarm, picked up by the University of Utah Seismograph Stations, saw a total of 26 “local events” erupt between March 25 and March 26. The earthquakes were recorded roughly 16 miles east-northeast of West Yellowstone in Montana. According to the USGS, the individual quakes ranged in strength from magnitude 1.9 to just magnitude 0.1. The second swarm erupted just three days later about nine miles west of Old Faithful geyser in Wyoming. The USGS said in its monthly report: “March seismicity in Yellowstone included two swarms of earthquakes. “The first swarm of 26 located events occurred 16 miles east-northeast of West Yellowstone, MT, from March 25 to 26 and ranged in magnitude from 0.1 to 1.9. The geological agency said earthquake swarms like these are a natural occurrence throughout the supervolcano park. Earthquake swarms account for roughly 50 percent of all seismicity in Yellowstone. Out of the 127 total earthquakes, the strongest tremor struck Yellowstone on March 4. The “minor earthquake” was recorded around 10.16am local time when it peaked at magnitude 3.3. Geologists traced the earthquakes to a location about 14 miles north-northwest of Pahaska Tepee in Wyoming. The USGS said the earthquake was not reported “felt” and all other seismic activity at Yellowstone remains at background levels. The USGS’ March report also revealed there were four eruptions of Steamboat Geyser last month, on March 4, March 11, March 17 and March 25 respectively. The agency said: “Discharge measured at the Tantalus stream gage suggests that these eruptions were similar in size to those that occurred earlier in the current sequence, which started in March 2018. Geologists have also not noticed any major ground deformation during this time period. GPS stations across Yellowstone have not seen any surface difference and overall subsidence of the Yellowstone caldera is in line with previous years.